Luxurious and exquisite, extremely enhance the look of your car interior. Solar energy powered, the middle prayer wheel will keep running as long as there is sunshine. 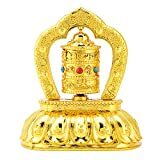 Buddhist prayer wheel design, for the best wishes of safety. Adopt electroplating process, lustrous and no fading. It can be widely used in car, home, office interior decoration, also a good gift for friends. 1. Please allow 1-3cm error due to manual measurement. Thanks for understanding!